Alexander McQueen: Spring 2009 Ready to Wear Collection. Faux-grain silk jacket from Alexander McQueen's Spring 2009 Ready to Wear Collection. Price on request. Emily Barletta Untitled (ball) clay, stuffing, yarn (2008). My first thought was of Barbie legs, sawn off and dipped in wax. A violent end to the women mummifed by the artist E. V. Day. On Thursday, we end National Poetry Month with Poem in Your Pocket Day. It's simple: select a poem you love, then carry it with you to share with co-workers, family, and friends on April 30, 2009. Poems from pockets will be unfolded throughout the day with events in parks, libraries, schools, workplaces, and bookstores. The Poets.org website has ideas and classroom activities. I'm giving you a few days notice so you'll have time to select something. I'm also going to suggest that you photocopy the poem. If someone came up to me with a poem, I'd definitely want to take it home and sip on it with a cup of coffee. Here is one of my favorites, but I'm not sure it is the right poem for my pocket. It might be this one. Or this one. Please tell us, in the comment section, which poems you might put in your pocket. I was blind to you when you loved me long ago. for a fragrance of the field, and a house, and a little heat. of the only letter I wrote to you. Photo credit: Heidi K. Rettig (2008) From the heart shaped rock collection down on our dock. Lunch With Specific Twitter Friends. A great lunch with my Twitter friends (and a little after lunch shopping) and the world seems like a friendlier place. Laughing is everything, isn't it? Pictured here, left to right: @sarahcofer; @beezelbarb; @shanlee. Not pictured: @melindacampbell; @superjenny and @fawndue. I've been in a period of epic boredom since the beginning of 2008. Not the kind of boredom that people talk about when they have nothing to do, more the boredom that comes from too many obligations that give too little joy. Before I was bored I was angry, and I'm just now realizing how closely related those two emotions can be. 1) To stretch out in front of a window in the sunshine and fall asleep. 2) To eat cupcakes and drink coffee at Dozen with my friend D.
3) To get in a magic transporter machine and find myself at Ten Thousand Waves. 4) To sit in the grass in strange, new, beautiful parks and watch people. 5) Food that nourishes me, that hasn't been sprayed with Crisco and sealed in plastic for shipping to a chain restaurant location. 6) To read a book, a love story that puts all others to shame. 7) To be back in DC, the closest thing I can identify to the concept of home. Where I know how to wander, and I know all the good, sunny spots a lonely person can go to be soothed. 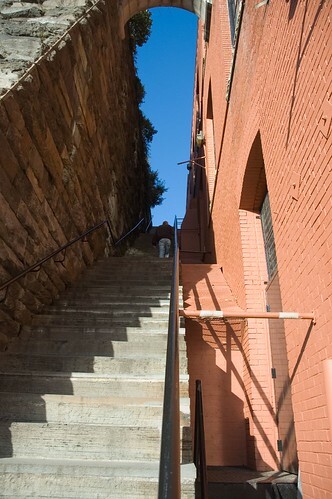 *The "Exorcist Stairs", Georgetown neighborhood, Washington, DC. Sixteen Candles., originally uploaded by Tessss. 2. 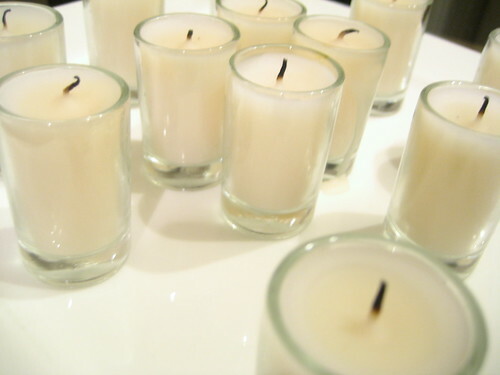 Face the candle and briefly examine the flame. 3. Close your eyes and imagine the flame burning bright and strong. 4. Think of the person who you wish to connect to and say their name seven times. 5. Then imagine yourself talking to them again. 6. Make a wish that you will see or hear from them again soon. 7. Blow out the candle. 8. Let me know if it works. via Madam Lichtenstein's Cosmic World. I get to be part of this wonderful project. Stick with it until the end and you will see my name. I'm Heidi, the "host" of the Missing Piece Treaties and the owner of the log cabin. I love the "April Showers" scarf featured in the most recent Purl Bee e-newsletter. The pattern is free and you can find it right here. Since I'm still working on this project, and this project, and two hats I haven't even mentioned...I don't think I'm going to take it on. Famous last words! We have many squirrels that live on our property, but Roy is special. He loves us. When Roy comes to the window, I can be sure that Spring has arrived in Montana. It's been a long, lonely winter without him. When we go to town, he's always waiting for us in the driveway when we get home to say hello. He has built two nests in the air conditioning system of my SUV. He fusses at Mike when his pine cones are swept off the deck, and he tortures our pets. But he's a little bit helpful. When I was working on this project, I was frustrated by the amount of time it was taking to rip the pine cones apart. So I got to thinking.... I left the pine cones on top of "Roy's Rock" and the next morning, a pile of cone petals was there waiting for me. I tried that same strategy when I wanted to make Christmas ornaments out of walnut shells. Even if it looks that way in Martha's photo, It's not that easy to cut walnut shells perfectly in half. So I left a pile of walnuts on the rock assuming Roy and I would have a similar sort of deal. In the morning - nothing was there. Two years later, I still find the odd shell on the property - some as far down as the beach - and I have to laugh. That I thought Roy was working for ME. Brian Dettmer autopsies books from the top, down. This beautiful pizza was made from a recipe in Nava Atlas' cookbook, Vegan Express. So far, we've loved every dish we've tried in this book. Even "Meat Man Mike" loved this pizza. The white sauce is silken tofu pureed with salt, then topped with steamed spinach, asparagus, and a scattering of sun-dried tomatoes. No cheese, no meat. I have to confess that I lied to Mike about the tofu. He walked just after I threw the tofu brick in the food processor and asked me what it was. Without batting an eye, I replied, "It's cheese!" And no one will ever be the wiser. The tofu becomes a smooth and creamy sauce that takes on the flavors of the vegetables. We love it here, but when the weather gets gloomy, Mike catches cabin fever. We took off last weekend to find some sunshine on the other side of the mountains. We did a lot of driving in central Montana. You can see all of the places we stopped on this map. The skies were wide open but the wheat fields were still dry and quiet. Power lines ran alongside the car for miles. shading towns breathing out their last breath. Meadowlarks sing from fence posts for visitors just passing through. Photo: Rebecca Jo Malmstrom, Duckie Uglings. I love these felted sweater birds in their pretty yarn nest. I met their creator, Becca Jo of Duckie Uglings, after she stopped by Two Kitties and left a comment. It turns out we are muy simpatico. Like me, she loves felting sweaters, making softies, works in theatre, and went to the high school in the town next to mine - which means we know people in common even though we have 1) never met; and 2) live 1500 miles apart. But I digress. Check out Recycled Goodness, Becca Jo's Etsy shop, to see some of her other softies! If you sew your own clothing, chances are you've been wishing for a dress form. They really help fit patterns to your measurements and really improve the look of your finished projects. The problem is they are pretty expensive. It's hard to justify spending hundreds on something if you're not very good, but its hard to get better at sewing clothes without one. When I saw this How To video on Threadbanger, it seemed worth sharing. This is Michaelangelo's Pieta, installed at St. Peter's in the Vatican in Rome, Italy. It's unfortunate, but the familiarity - maybe even ubiquity - of classical work can dampen its beauty. I've seen Pieta many times, but there was something different about this photograph that made me come back -more than once- to really look at the work of the great master, Michaelangelo. It seems to me that the Vatican has changed or improved the lighting, and the lighting is able to bring out the contrast between light and shadow, creating a feeling of visible tension between the two bodies. Look at the muscle of Christ's right arm and how it gives in to the pressure of Mary's hand. The position of that left leg and the angle of the foot and the head tilting back toward the sky.This is a body that is still soft and warm. You know that His body won't move, but you get the feeling that the folds in her dress could shift and collapse at any moment. The stone is alive. Pieta is exceptional work, even compared to the other masterpieces of Michaelangelo. It is the only piece of stone sculpture that he worked to completion. It is symbolic that he would create this image - of Christ just down from the cross - in stone. It was controversial in its day because the artist depicted Mary as a young woman. But to me, it references other classical depictions of the Virgin and Christ Child - how she holds Him in her lap like a baby. The mystery, to me, is how an artist manages to achieve all of this by working "backwards" from a slab. All this because the Vatican changed a light bulb. If you enjoy reading about symbolism in classical painting, I've also written about a Botticelli painting of the Virgin and Christ Child here, and a less traditional depiction by Max Ernst here. On my blog-a-versary, I posted a collection of some of my favorite posts from the last two years. A favorite project [perpetually] on my worktable was published in the first Blueprint magazine. I was thrilled when I heard from a blog reader that she had tried the project and it had gone well. She thanked me for the idea and said it helped her, that she had been feeling "kind of dead" lately and wanted to send me a ring as a gift. This is that ring. Pretty amazing! One of those blog moments that kind of makes you "verklempt." Now, blog reader Lori and I are CPF Forever and we talk every day on Twitter. Thank you Lori, for the really good mail! "I'm sending you this books as a kind of intro to Australian writing. It's hard to know where to start. Should one begin with a 19th century classic? Or with one of the feisty left wing women writers of the 1940s? Or the most recently acclaimed? In the end, I settled for a Nobel Laureate and the novel of his which I like best: The Aunt's Story. Next comes David Malouf who may well be our next Nobel winner. I chose his very first novel, Johnno, because it is about my home town in the era in which we both grew up. In fact, when it first came out, a friend gave it to me saying simply "It's us." He was right. Finally, Peter Goldworthy's Maestro, which I just enjoy. After I chose them I realised that they all in their different ways deal with the complex relationship that Australians have with Europe. More then, perhaps, than know. You may recognise some of that in certain generations of Americans. Both the Brisbane and Darwin described are long gone. Darwin after a Hurricane in 1974. Now rebuilt. Brisbane in the hurricane of development so that is now like Dallas on a river. I hope you enjoy." And this precious letter begins a new category, and a new week of posts on Good Mail. Stay tuned. There is no greater gift for a new baby than the customized onesie. Relatively inexpensive to give, but such a wonderful thing for a new mom to receive. My friend D. and her husband P. just welcomed a brand new niece, Barbara Jean, to the family. D. embroidered these custom onesies for Barbara Jean. "Madison "Pop" (pronounced "Pup") Peterson - was a railroad steel man, a farmer, and an outdoorsman whose family name goes back in northwestern Pennsylvania to the Revolutionary War. He was born in the hills outside of Meadville, PA, in the winter of 1887. When his grandson Ed was a young boy - some time in the early 1960s - Madison entertained him on more than one occasion by drawing pictures of animals." Amazing work! I'm not sure how D. did it - I'm sure she will tell us in the comment section - but if it were me, I'd probably trace the image on to dissolvable stabilizer sheets (available at the fabric store), tape the sheet to my onesie, and embroider right through the stabilizer. When you wash it, the stabilizer will disappear. If you don't embroider, you might want to try using iron-ons or stencils and fabric paint - using designs printed on your home inkjet. You can check out the rest of D.'s onesies here.